September 11, 2001, is an odd choice for a musical. However, “Come From Away,” the musical show playing at the Ahmanson Theatre in Los Angeles until Jan. 6, tells a positive tale of people pulled together by truly unusual circumstances that day. The ensemble piece, featuring 12 actors who take on various roles, shows how people from all walks of life came together on a rock in the middle of nowhere. 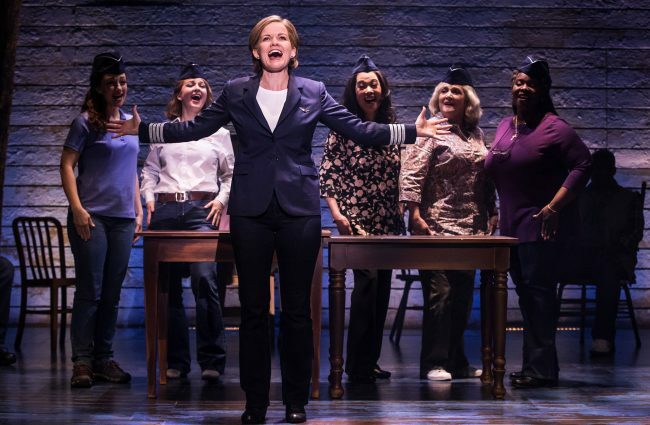 The songs in “Come From Away” are enjoyable and folksy, if not particularly memorable. However, the crowd-pleasing show offers an uplifting view of the best of humanity making the best of their situation. It is actually based on true stories and characters. When all flights were grounded after the 9/11 terrorist attacks, planes to anywhere in the U.S. had to land. Those planes coming across the Atlantic Ocean near the Arctic Circle redirected to a small Canadian town – Gander – on the island of Newfoundland. The airport there had been built to handle transatlantic craft before jumbo jets eliminated the need to refueling mid-trip. In 2001, the airport normally handled about six flights each day. On 9/11, 38 large airplanes carrying 7,000 passengers from all over landed in Gander, a town with about 10,000 residents. The townsfolk turned every available building into a shelter with quickly purchased or donated food, blankets, toiletries, clothes and more to house their unexpected guests, who were not allowed to get their luggage. The local populace brought the so-called “plane people” or “come from aways” to their homes to shower and sleep. The musical tells the story of the initial reaction in Gander and when the plane people found out about the terrorist attacks. It relates the confusions and uncertainty airline crews were faces with and the turmoil and fear for passengers stuck there for an indefinite period. Later the plot shows everyone making the best of the situation and having a little fun, too. “Come From Away” is built as an ensemble piece with no real scene-stealing performances. The only dominant solos feature Becky Gulsvig as ground-breaking female pilot Beverley and Danielle K. Thomas as Hannah, who feels helpless as she is unable to find out the fate of her firefighter son. The cast has to make quick accessory changes that let the audience know which of their characters they are currently portraying. Two examples: Gulsvig wore a pilot’s jacket whenever portraying Beverley and a vest as Annette; Nick Duckart put a Muslim kufi on his head whenever he was Ali. Other members of the excellent cast include Kevin Carolan, Harter Clingman, Chamblee Ferguson, Julie Johnson, Christine Toy Johnson, James Earl Jones II, Megan McGinnis, Andrew Samonsky, and Emily Walton. The set design by Beowulf Boritt enhances the ease for the audience in figuring out if the ensemble is portraying plane people or Islanders. It is a simple collection of tables and chairs that morph from airplane seats to a bar scene to other configurations. “Come From Away” is about 100 minutes with no intermission. However, this warm example of people making the best of a truly bad situation keeps the audience engaged throughout. An intermission would probably have hurt the momentum. People can see “Come From Away” at the Ahmanson in Los Angeles until Jan. 6, 2019. Then, the show moves to San Francisco; Costa Mesa, Calif.; Las Vegas; and Portland, Ore; before a swing across Canada in March. The U.S. portion of the tour resumes late March in Nebraska. The musical is also still playing on Broadway and in Toronto. Photo by Matthew Murphy of, L-R, Megan McGinnis, Emily Walton, Becky Gulsvig, Christine Toy Johnson, Julie Johnson and Danielle K. Thomas in “Come From Away.” Courtesy Center Theatre Group/Ahmanson Theatre.